Hyperbolic coral forms by Christine Werthiem and Margaret Wertheim. Photo by Alyssa Gorelick. Crocheting the Coral Reef: The Institute for Figuring, a Los Angeles based organization dedicated to bringing fractals, hyperbolic space and other high-flying mathematical and scientific concepts down to earth, has embarked upon an unusual project that’s inspired by the plight of the Great Barrier Reef. It is promoting the creation of woolen models of a coral reef, using techniques of hyperbolic crochet that were discovered by the mathematician Daina Taimina. This environmental version of the AIDS quilt is meant to draw attention to how rising temperatures and pollution are destroying the reef, the world’s largest natural wonder, said Margaret Wertheim, an organizer of the project, who was in Manhattan last weekend to lecture, offer crocheting workshops and gather recruits. The reef is scheduled to arrive in New York City next month. 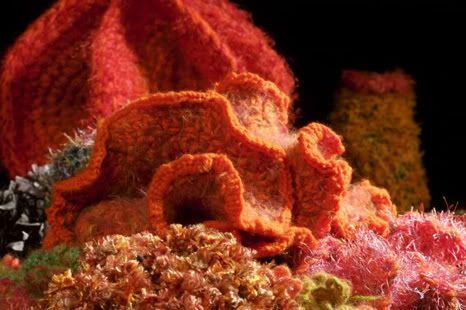 Ms. Wertheim, a science writer, and her twin sister, Christine, who teaches at the California Institute for the Arts, came up with the idea of creating a woolly homage to the reef about two and a half years ago. The Wertheims, 49, grew up in Queensland in Australia, where the approximately 135,000-square-mile reef — and the billions of tiny organisms that it comprises — is located. But the Hyperbolic Crochet Coral Reef is much more than a warning about global warming. It marks the intersection of the Wertheims’ various passions: science, mathematics, art, feminism, handicrafts and social activism. Hyperbolic crochet was itself the outgrowth of an unexpected branch of geometry. For two thousand years mathematicians attempted to prove that the only possible geometries were the flat, or Euclidean, plane, and the sphere. Great minds expended themselves on the effort, only to discover in the nineteenth century that a third option was logically necessitated. The discovery of this new “hyperbolic space” ushered in the field of non-Euclidean geometry, the mathematics underpinning general relativity, which aims to describe the shape of the cosmos. Mathematicians’ skepticism about hyperbolic space had been based in part on their inability to imagine how it would look, for they had no way to model it physically. Most were thus astounded when, in 1997, Dr. Daina Taimina, a Latvian émigré at Cornell University, presented a hyperbolic structure made with crochet. Nature, meanwhile, had discovered the form in the Silurian age. 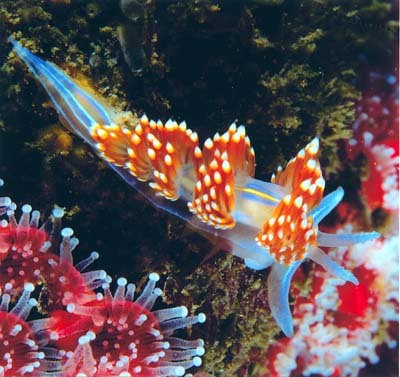 Lettuces and kales — the crenellated vegetables — are manifestations of nearly hyperbolic surfaces, while in the oceans, corals, kelps, sponges, nudibranchs and flatworms all exhibit hyperbolic anatomical features. And so a woolly manifestation of a reef is not as unlikely as may first be supposed. Through the lens of crochet we may thus discern a hitherto unsuspected line connecting Euclid to sea slugs. Ways of constructing once perceived as “merely” women’s craft, and dismissed from the cannon of scientific practice, now emerge as revelatory forms of a more complex, embodied way of thinking about the world both mathematically and physically. Now you know, fractalists. Ditch those mice and tablets. Pick up your needles and hooks instead. This news will likely warm the dark hearts of some of OT’s adversaries. Isn’t this exactly what Tim and I deserve for our many blogging perfidies? The. Death. Penalty. But wait. Haven’t some our most vocal troll-hecklers recently gone on to form their own blogs? Hmmmmm. That’s right. Absolutely nothing. No emails. No letters. No updates to the FAQ on the FUC web site. But you already knew the answer, didn’t you? And it’s what we expected, too. After all, our fractal emperors can’t spare the time to address the riff-raff and hoi polloi as their carriages pass through peasant villages. Better to turn a blind eye to such peon baseness. Why should I waste my beautiful mind on something like that? And to think our adversaries say we are the cowards. Besides, maybe if the BailOutters and UFractali and the most important fractal artists in the world* ignore us, we’ll just go away. Except we won’t. We are here to stay and are committed to bringing fairness and professionalism to both the Fractal Universe Calendar and the Benoit Mandelbrot Fractal Art Contest. And I’ve waited long enough for a reply from the FUC editor. Now, I’m going to write Avalanche — the publishing company that produces the Fractal Universe Calendar. Maybe someone in the publishing house will be more inclined to address at least some of my questions. Stay tuned. It [the 2006 BMFAC exhibition] will examine quality works from the most important fractal artists in the world.